It was a tough kickoff to 2019 at Hadlock Field as the Reading staff combined for a two-hit shutout. A Brett Netzer double had the only extra-base hit for the Sea Dogs, with CJ Chatham delivering the only other knock. Kyle Hart struck out a career-high 11 batters and did not issue a walk, but the left-hander got no luck on balls in play. He allowed four runs on nine hits, seven of which were singles, in taking the tough-luck loss. Zach Schellenger pitched around three walks in a scoreless ninth inning. Schellenger, a sixth-round pick in 2017, moved into the SoxProspects.com Top 20 in the new rankings released this week. Jarren Duran made a splash last summer after the Red Sox took him in the seventh round out of Long Beach State, ripping 11 triples in 67 games on his way to a .357/.394/.516 line across two levels. He does not seem to have missed a beat, as the center fielder led Salem's 16-hit barrage in Wilmington. Duran tripled once again, capping a 3-for-5 night. Jagger Rusconi tallied four hits, and Marino Campana went deep for a three-run homer in the seventh to put the game out of reach. Kutter Crawford got the opening day call, allowing two runs (one earned) on two hits in four innings, striking out seven and walking two. Eduard Bazardo was excellent in relief, allowing just one hit in three shutout frames to get the win. Andrew Politi struck out three in two perfect innings to close out the victory. It looked like a pitchers' duel on paper, with hard-throwing right-hander Alex Scherff (pictured, right) scheduled to take on Mariners 2018 first-rounder Logan Gilbert in the South Atlantic League opener, and that is the way it played out Thursday evening. Scherff was excellent, scattering two hits in his five scoreless innings of work, striking out four and walking one. John Calvagno of Notes From The SALLY reported that Scherff was at 94-97 with his fastball, mixing in a cutter and a curve. Despite the effort, he left with the score knotted at zero. Hunter Haworth followed with four scoreless innings of his own until surrendering a score to the automatic runner in the 10th. Of more immediate relevance to those who watch the major league club, Dustin Pedroia had a solid rehab effort as he nears his activation. Pedroia connected for two of Greenville's four hits, including their only double and a walk. 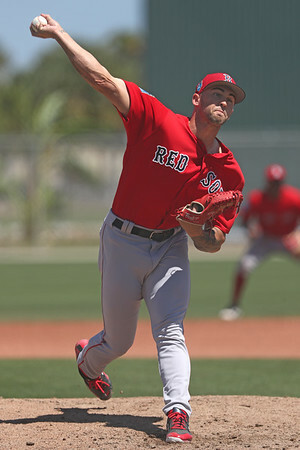 Triston Casas, Boston's top pick in 2018, got his first career regular-season start at first base. He was 0 for 4, but stole a base after reaching on an error. 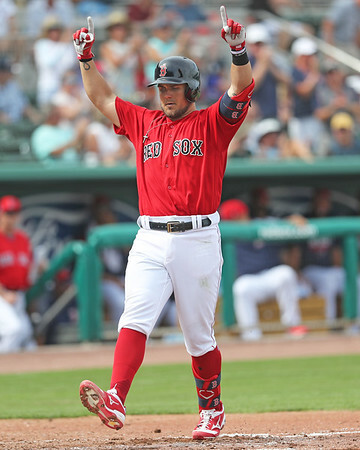 Player of the Day: Michael Chavis has gotten off to some tough starts in his pro career, due to injury and a suspension in 2018. Fortunately, the top prospect in the system started 2019 on the right note. He blasted a home run off the left field scoreboard, singled twice, and walked. The 2014 first rounder started at first base, and figures to see time at both second and third this year.